Mish's Global Economic Trend Analysis: Gallup CEO Calls 5.6% Unemployment Rate "The Big Lie": What's a Realistic Unemployment Rate? 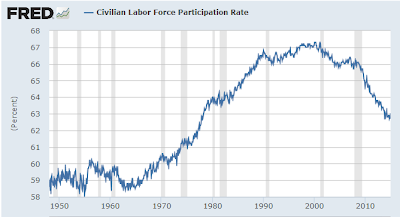 Gallup CEO Calls 5.6% Unemployment Rate "The Big Lie": What's a Realistic Unemployment Rate? 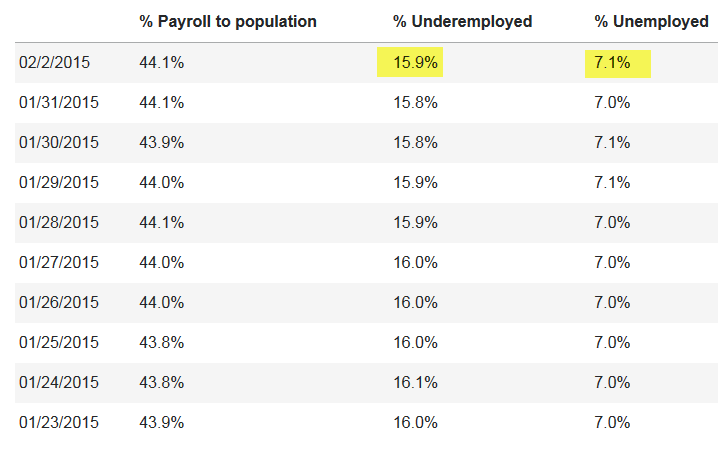 On Linked-In, Gallup CEO, Jim Clifton proclaims 5.6% unemployment is "The Big Lie". And it is. I have talked about this for years, but perhaps it would be interesting to hear the same thing from a CEO of a big agency. I picked this story up from ZeroHedge. Emphasis in italics is mine. Clifton first calls the unemployment rate "extremely misleading" but later on calls it "The Big Lie", and that is the title of his Linked-In article as well. Gallup concluded the unemployment rate is 7.1% with another 15.9% working parttime who want a fulltime job. Those are daily numbers, not seasonally adjusted so cannot be compared directly with BLS monthly reports. Let's take a look at the numbers two more ways with BLS data. 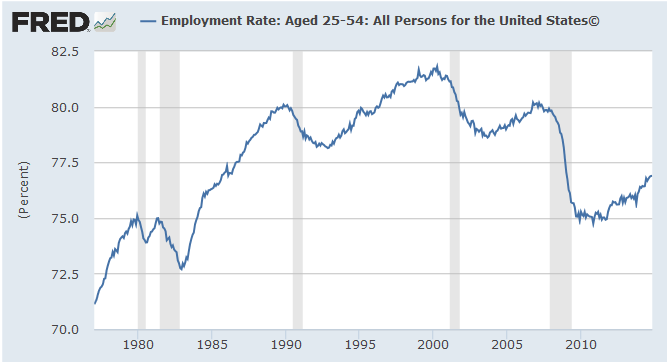 The participation rate is percentage of the working-aged people (over 16) who are either employed or are actively looking for work. As you can see that number has plunged. However, the chart is skewed by two factors making it a poor choice as proof of how bad things are. Mass entry of women into the workforce starting in the 1960s. Let's try one more way: Who is not working that arguably should be working? 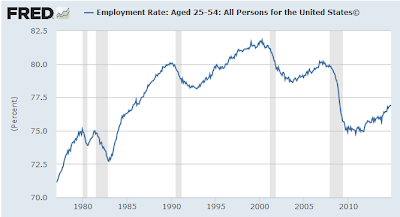 Since 1999 the percentage of people aged 25-54 who are working is down quite a bit. To be sure, some of them are staying in school longer. If you are in school and not working, you are not counted as unemployed. If you are in school and working you are counted as employed, even if you work 3 hours a week. These factors have an artificial positive bias for the unemployment rate. 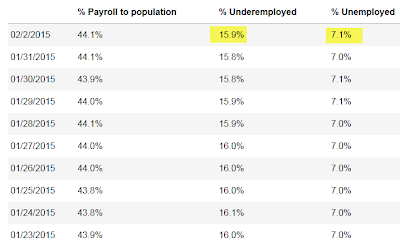 Because of all the distortions about what constitutes unemployment and employment, including frequent double-counting of part-time employment in the payroll survey, I believe it is purposely difficult to calculate a realistic unemployment rate. No politician wants unemployment going up on his watch, so over time, the methodology of calculating has changed. Add in disability fraud and unwanted retirement and the number would soar. Are you physically able to work a job? In regards to number three, one would need to weed out purposeful disability fraud, but even if errors were made in this category, the numbers would be far more reflective of what's happening than the current purposeful distortions. The above questions would pick up students in school who would rather be working, and it would also pick up people on forced retirement whom would rather be working. I define forced retirement as people out of money, with no income, not wanting to retire, but having to retire simply to collect Social Security money. What's a "Realistic" Unemployment Rate? Based on demographic trends, I suggest the real unemployment rate after weeding out disability fraud, forced retirement, kids hiding out in school for lack of a job, and those who are not counted as unemployed simply because they gave up looking. Realistically, the unemployment rate is more like 9% than 7%. Clifton says the official unemployment rate of 5.6% is "The Big Lie". I agree. The only dispute is the attempt to figure out "Just how big a lie is it?"